A medical billing career is not the same thing is medical coding. Many people lump them together as one career, but they are actually two separate careers. 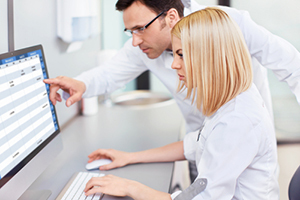 Our medical billing school teaches a small amount of medical coding with the billing course. That's because superbills and other billing tools have to have appropriate medical codes or the medical claims won't be paid. The medical billing clerk may get the codes from the physician. Very few medical billers actually do more than basic medical coding. We believe it's important for medical billers to have an understanding of medical coding, and it is included in our online medical billing program. What does a medical biller do? Medical billers are an important part of the medical office team who processes insurance claims so the physicians and office staff get paid for what they do. Medical billing is typically done in a hospital, clinic, insurance company, or physician office. A medical billing career requires knowledge of medical terminology, anatomy & physiology, disease processes, and medical procedures. The Andrews School online course for medical billers also includes a study of rules and regulations that apply to medical billing and coding. Professional certification after graduation may increase job options. In a small medical office you may find a medical administrative assistant, medical secretary, or medical receptionist working in some or all of these roles. In larger offices and clinics the job is specifically assigned to a medical billing specialist. Become a medical coder if you enjoy problem solving. You will usually work on-site and your work will often require you to interact with medical office staff, physicians, insurance company representatives, healthcare administration advisers, and patients. A career in medical billing requires moderate keyboarding skills. While a formal typing class if not included with our program, your typing speed will improve as you go through the course. Even though your specific duties and the way you do them will vary from medical office to office or hospital, most of the time you will head straight for your computer. You may have an inbox with a stack of new patients for you to check over. You’ll want to make sure that the forms include all of the pertinent information and that it has been entered into the database and the claims forms correctly. You may have another batch of forms with procedures waiting to be billed. This is where the level of one Medical Biller will different from that of another. Some will just enter the terms and procedures without thought. Others will have the skills to recognize when information is missing or just doesn’t look right. We train our graduates to be able to recognize errors and know the process to follow to fix them. There will probably be weekly, monthly, and/or quarterly reports. These reports tell the story of how your billing procedure is working. You’ll learn how to read and interpret the results of these reports so appropriate action can be taken. You may also have to provide additional instruction or training to other office team members to help minimize errors that result in lower payments or denied claims. Will you have to do “collections” as a Medical Biller? In some medical offices the Medical Biller does collections. Others have a specially-trained person to contact patients for payment when their account is past due. You’ll want to be familiar with regulations regarding collections whether that is one of your responsibilities or not. How much contact will you have with others? Most physicians will check in with the Medical Billing section regularly. You are, after all, collecting the money that will pay staff salaries. In most offices the Medical Biller will also have some patient contact, both by phone and in person. There will also be phone calls and letters from insurance company representatives who have questions about a procedure or diagnosis. You may even get a few calls from the collection agency your employer uses to verify that a patient actually did make the payment they claimed to have made. You will need to know exactly what information can and can’t be released. The information you will deal with every day in your job is confidential. That information must be protected. You’ll also want to remember that these “accounts” are real people, not just numbers and facts. Refuse to become detached and uncaring. Of course you won’t be able to fix all problems, but you are in a position to help make each interaction the patient has with your office as smooth as possible. That, in itself, is no small thing when the patient is already stressed or in pain. If you are ready to get started, give us a call. We’ll make the process as easy and stress-free for you as possible. Enrollment is ongoing throughout the year. All books and materials for the medical billing course are included. When you write or call, linda@andrewsschool.com or 405-721-3555, let us know how you heard about us. We'd like to know if you were referred by a medical billing employer, one of our successful graduates, or an online search.